I love rum. Rummy, rum, rum. Rum for me, rum for you, but mostly rum for me. Years ago, my friend Keith Waldbauer helped to create an obsessed monster while he was tending bar at Union. Then by the power of the interwebs and Tales of the Cocktail I met other like minded folks like Matt Robold, Blair Reynolds, and Craig Hermann. We waxed poetic over rum and intense geekery. Make no mistake, if you care enough about anything to blog about it, you are a geek. After all, if you just liked something, or were normal, would you take the time to write about it, take pictures and make sure people knew what the hell your opinion was about it? Nope, didn’t think so. So, I’m nuts about rum. That isn’t to say that I don’t love other spirits, I just have an unabashed favourite spirit. Dark rum, light rum, rum industrial, rhum agricole, old rum, young rum, spiced rum, dry rum, sweet rum, thick rum, thin rum, really old rum, really really old rum, rum, rum, rum, rum, rum I will drink it all and chances are I will enjoy it. So to spread the gospel of rum, welcome to my first review of a rum. 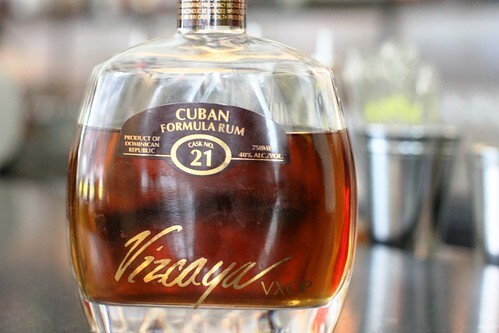 Vizcaya VXOP Cask 21 from the Dominican Republic was one of my latest purchases. The notes from the producer say that it’s made in the old Cuban style by a family that has been making rum since 1820 and who moved to the Dominican after the Cuban Revolution. Made in the rhum agricole method – which means it come from pressed cane juice and not molasses or sugar, it’s aged on bourbon casks and then blended to produce the final product. This is a very rich rum, fairly thick on the tongue, and incredibly smooth. Swirling in the glass does not leave a whole lot of legs, it’s a rich amber hue that slowly lets light through like a pane of old stained glass. The flavour is quite rich, with almost no burn at all, vanilla and caramel notes being predominant. Caramel and lightly toasted sugar come through on the nose. It is much more like aged blended rum industrials such as Zafra (warning, annoying site) or Zafra (also annoying site) in character than it is like other agricoles. There is no grassy note or brandy like character to it as I would expect from an agricole like Rhum Clement or St James. This is first and foremost a sipping rum, whether neat or on ice is up to you, me, I’d drink it neat, maybe with a light beer on the side. If I were to make a drink with it, it would be an old-fashioned, though I would say the same thing about any other similar rum. Get some, enjoy it, say thank you later. Someday I’ll come up with a rating system, for now I will say this is delicious, a great deal, and you should get definitely get some. The problem is this: no one really knows what “rum” really is. Unlike say single malt whisky or bourbon, what we loosely call “rum” is made without real standards, without purity or age standards. As a result most of what is marketed as “rum” – though originating from cane juice or molasses – is then altered with all manner of unadmitted additives, flavoring and adulterants. For example: sugar, artificial vanilla, spices, caramel and the like. By adding these a young, continuous distilled, relatively cheap rum can be made to taste like an expensive pot stilled, aged rum. We all are losers. Without honesty in labeling, we are left with no standards of comparison. Now there are exceptions: Richard Seale is quite public about the fact that his rums have no secret, flavor additives. Compare to say Zacapa 23 or the new Zafra 21 – whose purity and ages are doubtful. If you want to taste real, honest and pure rums I’d point you toward Seales 10, Mount Gay Extra Old, Barbancourt Five Star, Appleton Extra and others that we discuss at The Rum Project Forum. I love it Rock. You and I will be drinking rum together for years, methinks.